a process experienced as a renewal or transformation of the personality. Psychological rebirth was Jung's focus. Induced by ritual or stimulated by immediate personal experience, it results in an enlargement of the personality. He acknowledged that one might feel transformed during certain group experiences, but he cautioned against confusing this with genuine rebirth (individuation). If any considerable group of persons are united and identified with one another by a particular frame of mind, the resultant transformation experience bears only a very remote resemblance to the experience of individual transformation. A group experience takes place on a lower level of consciousness than the experience of an individual. This is due to the fact that, when many people gather together to share one common emotion, the total psyche emerging from the group is below the level of the individual psyche. If it is a very large group, the collective psyche will be more like the psyche of an animal . . . .
Arnold Bocklin's 3rd version of ISLE OF THE DEAD, a stunning series of paintings. This is the "daylight" version. In the pleroma there is nothing and everything. It is quite fruitless to think about the pleroma, for this would mean self-dissolution. CREATURA is not in the pleroma, but in itself. The pleroma is both beginning and end of created beings. It pervadeth them, as the light of the sun everywhere pervadeth the air. Although the pleroma pervadeth altogether, yet hath created being no share thereof, just as a wholly transparent body becometh neither light nor dark through the light which pervadeth it. We are, however, the pleroma itself, for we are a part of the eternal and infinite. But we have share thereof, as we are from the pleroma infinitely removed...in our essence as creatures, which is confined within time and space. Yet because we are parts of the pleroma, the pleroma is also in us. Even in the smallest point is the pleroma endless, eternal, and entire, since small and great are qualities which are contained in it. It is that nothingness which is everywhere whole and continuous...nowhere divided. We are also the whole pleroma, because, figuratively, the pleroma is the smallest point in us and the foundless firmament about us. The question ariseth: How did creatura originate? Created being came to pass, not creatura; since created being is the very quality of the pleroma, as much as non-creation which is the eternal death. In all times and places is creation, in all time and places is death. The pleroma hath all, distinctiveness and non-distinctiveness. A man should be able to say he has done his best to form a conception of life after death, or to create some image of it – even if he must confess his failure. Not to have done so is a vital loss. For the question that is posed to him is the age-old heritage of humanity: an archetype, rich in secret life, which seeks to add itself to our own individual life in order to make it whole. --C. G. Jung, , Memories, Dreams, Reflections. (NY: Vintage, 1963), p. 329. In Lament of the Dead, the late Jungian psychoanalyst James Hillman (The Soul’s Code) and historian Shamdasani (C.G. Jung: A Biography in Books) engage in conversations about the Red Book, a tome recently unearthed, edited, and translated by Shamdasani, in which Jung explored the ancestral, archetypal, and mythic figures that populated his fantasies. It explores the crux of individual encounter with one's own depths. Murray Stein says we need to re-vision the dead and to hang on to our dreams and visions of the afterlife, even in a skeptical environment. Can we reverse the wheel of history and cherish in our times the dreams, visions, beliefs, and rituals of our ancestors that paid homage to the afterlife? They spared no means in erecting visible signs of a continued presence of the dead among the living. The vast burial mounds of Neolithic culture, the great pyramids of Egypt, the wooden stretchers of Native Americans were visible signs and tangible embodiments of a continuous universe, inspiring great works of art that survived the ravages of time. Such processes can only be indirectly observed, namely by the Eros consciousness. If one is unconscious of it, spontaneous, non-intentional parapsychological, especially psychokinetic events happen. They are teleological or final; “effects” without any “cause.” The depth psychological aspect of such a change on the level of consciousness consists mostly in an unintentional breakdown of the will-possessed Logos ego (the “conscious king”), and corresponds to Jung’s “night sea journey” of 1913 to 1918. It is the forced transformation into the Eros ego, the “conscious queen.” Later Jung called this principle behind this process the counter-will of the unconscious. The winged dragon represents the Anima Mundi, or Soul of the World, which is the sum total of planetary existence -- the holographic blueprint on which form is based, the informational level or primal source of being - Zero Point. It is said that medicine providing the gift of youth can be made from its venom. The dragon is a healing power. The spiritual food of immortality signifies the ability of the ego to assimilate the previously unconscious aspects of the Self. This is the elixir of youth that creates the immortal body, equivalent to the Philosopher's Stone. The Stone is kept in the custody of the reawakened Dragon, the Adept who inhabits his or her (subtle body) Body of Light. Alchemy itself is a triple process of uniting the physical, psychological and spiritual. In Masonry, each line of the triangle itself symbolizes a kingdom of nature -- mineral, vegetable and animal. Psychologically, the dragon is the union of ordinary human reality with the transpersonal Self and a passion for transformation. Some now say it is a symbol of DNA or the kundalini energy. Thus, it is a symbol of the Great Work. All these "ghosts" are ours: Calculate from your parents and double the number of ancestors for each generation. That comes out to 2 to the nth power. So, when you get to 64 generations back you have something like 18 quintillion ancestors. At 25 generations the number overruns the population of the country to 18 quintillion. So, yes, many of the ancestors have to be the same people. So, you can say we cross many paths many times over. Being and non-being creates the interplay of the opposites that creates movement. It is the means through which the individual is pulled out of the extroverted life of division and into the introverted life of union and oneness. The Gnostics felt that procreative power is only a special instance of the procreative nature of the Whole. In the Holy Wedding archetype, the unio corporalis of Hermetic alchemy, the queen and the king create a new world with their union. Thus, genealogy is an analogy for the recursive self-fertilizing potential of the psyche. In the energetic feedback of psychobiological coniunctio, serving the psyche means being in-formed by it. The essence of life, the world soul, does not need a masculine partner for her creation and incarnation process. The creative life essence influences also the beyond and its “inhabitants,” the deceased in their essentially timeless and spaceless domain. They seem in some way to be resurrected from death in their afterlife. We observe processes in which physical and/or psychic energy transforms into the magic energy of the unus mundus and re-transforms into physical/psychic energy of higher order. Symbolically, it leads to to the cure of the disease of mankind and the universe -- the panacea. Spontaneous realizations become incarnated in our world; creation by mere observation. Our creative power emerges out of the psychophysical root of the sexual drive . The Crusader, who is dead as well as still living, is a symbol of the repressed but still living realm of the deeper principle of the creative power, of the unus mundus, the “intermediary realm,” only psychophysically obervable. Melusina is a symbolic equivalent to the Crusader, a “psychic principle with quasi-material attributes” (C.G. Jung). Thus, she also symbolizes the principle of matter-psyche, magic energy. The water-nixie and her acausal incarnations can only be observed by an altered state of consciousness. Matter-psyche is the energetic principle of the psychophysical nonlocal world, of the subtle body and of the world soul. The psychophysical quantum leap is nonlocal. Melusina adds a further aspect to the Hermetic unio corporalis: Since she lives (also) in the blood of men and releases the blood of Jesus Christ, the Anthropos (the God-man); she redeems herself. Translated into a modern scientific language this motif means that such incarnation processes happen themselves, acausal or indeterministically. This means especially that the Eros ego has the duty to just observe these inner acausal processes. This attitude is exactly contrary to the one in Jung’s Active Imagination. It is some sort of a “passive imagination”, active passiveness. (Remo Roth) -- Simply by observing, we are loving into being. Melusina/world soul/dea abscondita corresponds to the tripartite goddess of the Celts – the magic energy of the unus mundus. We are at the end of a long and winding genetic journey that continues after and through us. We are probably all connected by the 25th gr-grparents if you do the math. There is a great possibility that we are descendants (or are related) from almost everyone alive some seven hundred years ago. Considering the line of our parents as Nº 1, the number of persons is 33,554,432. That number is the theoretical result of (x2) progression, since many of those ancestors are the same persons. Yet, somehow a determined gen can survive intact through all those descendants and become a particle of memory that will give you a dejá vu once in a while. Jung calls attention to the one deep, missing part of our culture, which is the realm of the dead. The realm not just of your personal ancestors but the realm of the dead, the repressed weight of human history. The real repressed is like a great monster eating us from within and from below and sapping our strength as a culture. Joseph Campbell said, "What we call monsters can be experienced as sublime. They represent powers too vast for the normal forms of life to contain them. . .Meanwhile, you’re climbing, until suddenly you break past a screen and an expanse of horizon opens out, and somehow, with this diminishment of your own ego, your consciousness expands to an experience of the sublime." Genealogy widens and deepens our sense of self. It ignites a sustained dialogue with the past that collapses the timeline. Time dilates. contracts, and compresses. It is all that is forgotten, and not just forgotten in the past, but that we are living in a world which is alive with the dead, they are around us, they are areas. They are with us and are us. Such revelations throw light on things, helping us see in the darkness of the depths. As long as a symbol has life, it has magic and meaning. We can be consciously in the stream not the victim of events. Such water of life becomes refreshing, not drowning. Crossing the great river or sea is a rebirth image. Genealogy can be a highly synchronous process. That is, you can miraculously find some clue or elusive missing bit, or come across a meaningful story in some uncanny way even without looking. Jung said that “Synchronicity reveals the meaningful connections between the subjective and objective world.” Sometimes it feels like the ancestors are pulling the strings. The figures, the memories, the ghosts, it's all there, and as you get older your borders dissolve, and you realize "I am among them" and understand your identity at the deepest level. Everything penetrates everything at all levels from the quantum to cosmological. There is both physical and spiritual, objective and subjective generation. An Arab text says, "the different spiritual and corporeal forces must be converging and not moving apart, the physical and spiritual forces must be similar so that they can mutually help each other." Jean Dubuis said, "The whole alchemical process occurs simultaneously with the inner and the outer. In this sense genealogy is therapy for the dead and ourselves. We can allow them to work on us as we work on our lines. Genealogy, particularly of ancient lineage shares many of the exemplary tropes of Jungian transformation and alchemy, such as the Royal Marriage (Royal Syzygy), Holy Grail, union of opposites, and heroic god-kings. Matter and spirit continually pull the soul in opposite directions. The poles of the psyche are united in an integrate duality that is likened to a marriage. Reality becomes psychic and psyche becomes real. In alchemy this marriage of opposites is called coniunctio, a new perspective or functional unification of soul and spirit, including the feminine and masculine aspects of self. That allows you to experience the opposites simultaneously from an integrative or nondual viewpoint that brings new freedom and a new burden of knowledge. The ascent to another way of being, the ascent of transformation, cannot occur without disintegration, without the process of breaking down completely -- being pulverized really, physically, emotionally, spiritually. If the container of self is not smashed, the vision cannot enter. The vision is the flash of light that re-organizes the self. Afterwards, if one is fortunate and graced by the generosity of the gods -- one reconstitutes, or is reconstituted, according to the laws and principles of a new life, a new dimension, a new world, a new universe. As one of today's most popular hobbies, genealogy symbolically reflects the search for wholeness and the self-fertilizing ability to create the subtle body or deified body for the afterlife. Death means "letting go", emptying the mindbody, whether permanently or in the ego-death of meditation (die daily), by means of silence, immobility, internalization, and spontaneity. The empty body becomes the Grail filled with the incorporeal plenum. Sub Rosa is the symbol of such pregnant silence. Remarkably, at the far reaches of our genealogies we find legendary and mythic figures who may or may not have been based on living personalities. But, they continue to live as progenitors within us, informing us as 'powers': spirits, daemons, gods, archetypes, laws, ideals, or whatever name we give such factors that we find powerful, dangerous, helpful, grand, beautiful, and meaningful enough to devote attention and love. Things become alive with meaning through contemplation. Images arise out of the unconscious, out of nature. men to build vast tombs and places of worship filled with every kind of treasure. An inescapable fact carried secretly in our lines is that most of us have ancestors on all sides of most historical conflicts due to intermarriage. The conceptual categories of psychology are conveniences, not as important as the direct experience (gnosis), without excessive theories or interpretations. We spontaneously experience our ancestors as deep spiritual connections and mysterious relations within our inner lives. Inwardly, they fascinate, and it's as if we were still ruled by such archaic gods, particularly so for those to whom the royal bloodlines 'speak'. Visionary experiences arise from such substrate. The "underworld" is the primordial cosmological groundstate -- the Spirit of the Depths. Such "clear vision", second sight, or anomalous cognition is an acknowledged family trait of the Bloodline, and possibly a product of the entanglement of our psychophysical processes. In search of our own myth we encounter an epochal human story, an "as if" reality in which the preconscious myths form us of the manifold essence of the inner world. What the ancients did for their dead! You seem to believe that you can absolve yourself from the care of the dead, and from the work that they so greatly demand, since what is dead is past. You excuse yourself with your disbelief in the immortality of the soul. Do you think that the dead do not exist because you have' devised the impossibility of immortality? You believe in your idols of words. The dead produce effects, that is sufficient. In the inner world there is no explaining away, as little as you can explain away the sea in the outer world. You must finally understand your purpose in explaining away, namely to seek protection. ~Carl Jung; Red Book. Jung discovered that 'the archetypes of the unconscious are the equivalents of religious dogmas " and they correspond to all the known religious ideas. He codified the phenomenology. However, this doesn't mean that the unconscious actually produces religious dogmas - these are the product of conscious thought working on and refining the raw material of the unconscious. 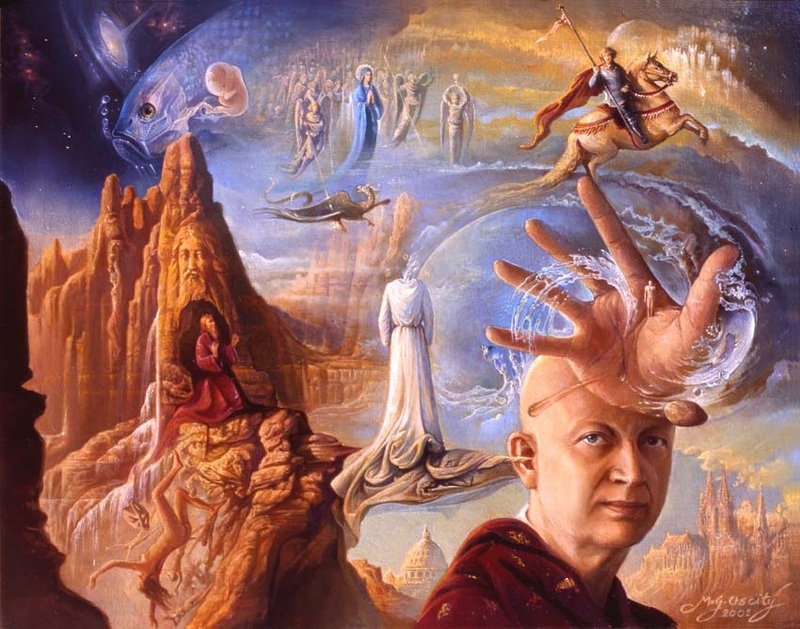 Jung’s explorations led inexorably toward the visionary tradition, the mysterium coniunctionis. Historically it has been symbolized in the holy wedding of two natures with many names: divine and human, male and female, eros and logos, king and queen, salt and sulfur, inner and outer, sense and nonsense, above and below. For Jung, the collective ancestry is indistinguishable from his concept of the Collective Unconscious - an autonomous organizing principle of structure and experience, reflecting the ancient idea of an all-extensive world-soul, patterns of information. They speak in images. Physics tell us the dead have a continued existence informationally in the virtual vacuum and energetically in the cosmos. Information is not lost in a holographic universe that is a unitary process. In holographic theory, fragmentation created by boundaries does not exist. Each component is an embedded part of an unbroken whole. Each ancestor is a node in the unfathomably vast field of meaning. Consciousness is the essential core of life—a vast, unbounded, unified field which gives rise to and pervades all manifest phenomena. The Luminous Gospels (Bauman) encourage us in this direction. "From this moment onward, I go forward into the Aion, and there, where time rests in stillness in the eternity of time, I will repose in silence." The key point is that Aion is not an afterlife, another form of temporality that begins after we die, but end (or "fullness") of time itself as a structuring dimension of reality. Natural philosophy sees mind, life and matter emerging from and returning to the womb-like nature of the vacuum potential, the energy sea that is the primary reality underlying spacetime. Biophysics tells us DNA is not merely a physical molecule; it is also the molecular form of universal creative consciousness, or “torsion” energy, as it self-transforms into what we perceive, belatedly, as the template for our physical bodies. The human being can be modeled as a quantum biohologram, or field body. In science, nonduality is an exploration of the nature of awareness, the essence of life from which all arises and subsides. Modern physics describes the world as a self-moving, self-designing pattern, an undivided wholeness. Everything, including life and consciousness emerges from and returns to the vacuum potential. Such ultimate vacuum states of consciousness correlate with the relative and absolute vacuum states of space described by contemporary physics as "The Field", scalar field, luminiferous ether, virtual vacuum, zero point and torsion field. Jung and the Gnostics called it the Pleroma or Plenum. The vacuum potential is a virtual background energy -- an ocean of virtual Light -- that exists throughout space, even when no matter is present. The ultimate end of all Gnosis is μετάνοια metanoia, or repentance, relinquishing material existence and returning to the Pleroma. Resurrection of the soul of the world means a raising of consciousness of created things, the world's psychic reality. Physical reality becomes psychic, and psyche becomes real--it "matters." Some notice a heightened communication and coordination between the unconscious and conscious. The difference between soul and external things no longer matters. Inner and outer world are both real and in fact radically participatory in this One World. Our DNA contains all the emotional records of our ancestors. Epigenetics tells us the dead potentially possess the transgenerational ability to psychophysically influence the fortune of the living through biogenetics, modulating mutations, disease, repair, stress response, genetic imprinting and gene expression, healing, even speculative inquiry. Could you relive and re-experience in some way great-great-great-great grandma’s or grandpa’s harrowing and hair-raising close encounter with a hungry bear two hundred years ago? What about some similar “peak experience” or life-changing event of an ancient relative five hundred years ago? What about five thousand years ago? After all, we know that at least some part of that history is inside all of us, right in the DNA in every cell of our body, right now. To conduct our own personal research and to find out for ourselves, maybe all we need to do is listen to our inner DNA. Listen to the voices, feelings, sights and experiences of our ancestors. 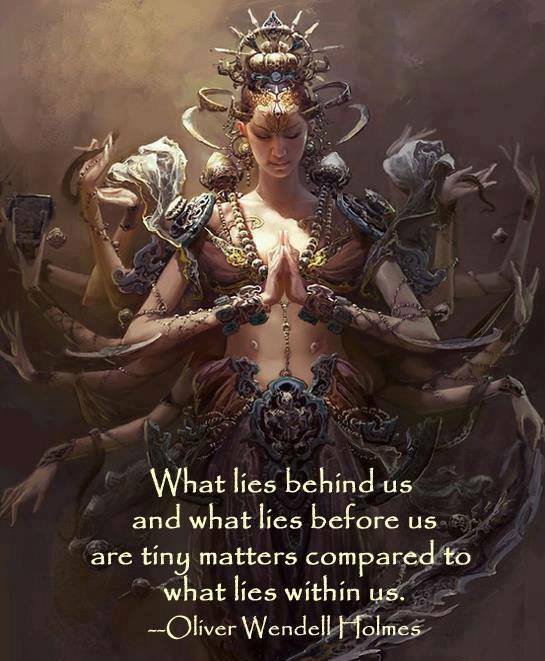 Their lives, joys and fears are within us. In that way, they are with us always. Epigenetics in psychology describes how nurture shapes nature. Nature refers to biological heredity and nurture means virtually everything that occurs during the life-span, including social-experience, diet and nutrition, and exposure to toxins. Epigenetics in psychology provides a framework for understanding how gene expression is influenced by experiences and the environment to produce individual differences in behavior, cognition, personality, and mental health. Ancestral worship, pilgrimage, and rites are among the oldest of such ideas serving the dead -- recognizing the dead, recognizing the phenomenology (possession, identification, projection), recognizing our own dead. This act does not imply any belief that the departed ancestors have become deified. Rather, the act is a way to respect, honor and look after ancestors in their afterlives as well as seek their guidance for their living descendants. Many cultures and religions have similar practices. Widespread communities were linked by pilgrimage, marriage and by descent 5000 years ago. Mounds and monuments have been made to memorialize the ancestors. The existence of the dead begs the question, "Why do we live?" Theories of the origins and nature of life are foundational to our self-understanding. They have been there since the beginning. The mystery of the nature of reality remains an unsolved paradoxical puzzle -- an enduring enigma. Veneration involves close and distant history, much brutality and oppression of all sorts. It means learning acceptance of the burdensome knowledge of the shadow of humanity lived out in history often governed by our ancestors, through prosperous and catastrophic times. This, too, is gnosis. Our potential for life, our unlived experience for good and evil, has surely been realized by someone within our lines. Genealogy helps us make a ‘descent into the unconscious’, a disturbing trip down the psyche’s rabbit hole from which we gather insights about the collective unconscious, informed by our ancestors. The Pharaohs were anointed with crocodile (dragon) fat, and thereby attained the fortitude of the Messeh (Messiah—Anointed One). The image of the majestic Messeh evolved to become the Dragon, which in turn became emblematic of mighty kingship. Each of us is at the epicenter of a giant webwork of ancestral lines which converge in our being. Our lines run through the mystical Grail women of Avallon in the Druid-inspired Pendragon epics of King Arthur, give rise to the Templars and Cathar gnosticism, and mingles with all the royal lines of Europe and Asia back into the mists of shamanic prehistory in Siberia and Iberia. The Bloodline is the Grail -- the royal blood informing us and igniting every cell. We are the Grail and we serve one another, in life and death. If we are overwhelmed or submerged we fall back into an antique mentality, falling into the attraction of the old cults, by going down into the past. It is possible to lose oneself in the mysteries of the still living archetypes, particularly presented as one's direct ancestors. The ancestors are, of course, the archetypes -- the psychological ancestors. The chief concern of Jung's Red Book, according to Hillman and Shamdasani, is giving voice to the dead - to history, to the actual dead, to buried ideas. Our culture is so forward looking, valuing novelty over reflection on the past, that the ancestors are too often forgotten. If we don't deal with them, their lament will continue to haunt and foil us. True novelty requires the seed-bed of the past's rich loam. Our's is a way not of information as much as transformation. So it’s almost as if we are part of an active imagination ourselves, particularly as we meditatively work our genealogical lines imagining those ancestral lives with a keen ear open to the past. Now this is so crucial because it opens the door or the mouths of the dead. 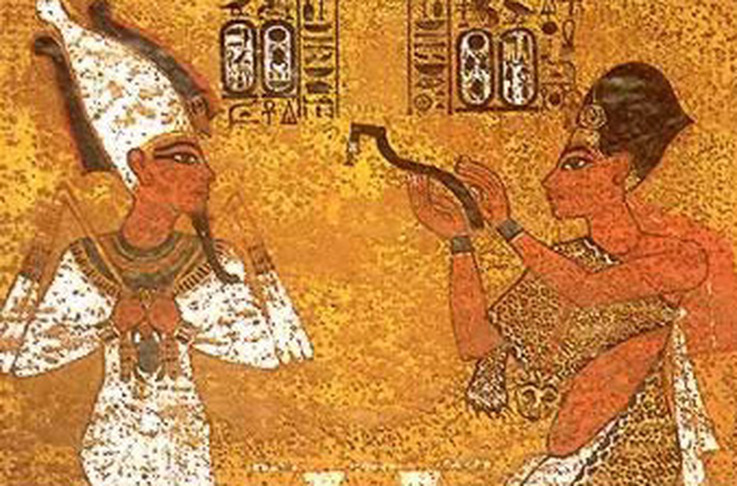 The 'Opening of the Mouth and Eyes' (generally abbreviated to 'Opening of the Mouth') is the ancient Egyptian title of the reanimation ritual. They believed such a ritual would restore sensory life back to the deceased's form, enabling it to see, smell, breathe, hear, and eat psychosensory offerings. The 'Imperishable stars', the 'Great Ones', are the northern costellations, associated by the ancient Egyptians as the place of the afterlife. In ancient times, Draco and the pole star Thuban were at the immoveable center of the cosmic drama. Draco was a divine emblem of the Sumerian kings, Egyptian Pharaohs, a symbol of the Egyptian Therapeutate, of the Essenes at Qumran, and was the Bistea Neptunis (the sea serpent) of the descendant Merovingian Fisher-Kings in Europe. Osiris is the archetypal resurrecting god - a symbol of regeneration. The Pharaohs of Egypt are among our royal bloodlines, so their ceremonies are our legacy. The Opening of the Mouth ceremony was a succession ritual and symbolic animation of a statue or mummy by magically opening its mouth so that it could breathe and speak. The opening of the mouth ritual was performed to animate the person who died so they could see and take sustenance in the afterlife. The rite varied somewhat in different eras, but sustenance and light remain the two key aspects of life desired for eternity. The eye as a place of rebirth is the meaning of the Eye of Horus. A statue is placed in the 'House of Gold' on a bed of sand, with the face oriented to the south. Fashioning the image (living Ka) is symbolically 'giving birth'. The sculptor is 'the one who causes to live'. 'Opening of the Mouth' is a symbolic re-enactment of the clearing of a baby's mouth at birth. The ceremonial adze was made from the metal of heaven -- meteoric iron. The Pyramid Texts associate the god Set with the iron adze used to open the mouth; New Kingdom texts associate Set with the bonds obstructing the mouth. Special ritual implements (peseshkaf ) for consecration were derived from blades used in childbirth to cut the umbilical cord. Meat offerings simulate an outpouring of blood, evoking the blood of childbirth, life, and lineage. The foreleg of a sacrificed ox transferred the life-force of the bull to the recipient of the Opening of the Mouth (alternately, the bull may have revived sexual powers). Rejuvenation is confirmed with robing and anointing, libations, fumigations, and purifications. In the Coffin Texts, Ptah joins Horus to open the deceased's mouth, then Ptah and Thoth transform the deceased into an akh, and Thoth replaces the heart in the body, so that the deceased remembers what has been forgotten and can eat bread as desired. The akh ('magically effective one'), was associated with thought, but not as an action of the mind; rather, it was intellect as a living entity. The Egyptian word, Ak means ‘light’, and aker means ‘light being’. Ak-hu is the archetypal Cosmic Man of Light, or ideal archetype of humanity found in a host of Hermetic and Gnostic teachings, whether Egyptian, Jewish, Christian or Islamic. As Mircea Eliade notes in Shamanism, among the Iglulik Eskimos, who were driven out of some unknown homeland, a sequence of initiations concludes with the ang-ak-oq (virtually the same word as Languedoc or L’ang-ak-oq), meaning ‘lightening’ or ‘illumination’. The emphasis here is on eyes and light. The akh soul also played a role in the afterlife, helping with prayers and intercession, inflicting punishment, or causing nightmares, feelings of guilt, sickness, etc. Veneration helped the deceased to "not die a second time" permanently in the underworld and to become an akh (unified Ba and Ka). The akh "grants memory always" to a person. The Book of Dead says "my mouth is opened by Ptah; the bonds that gag my mouth have been loosed by my city-god. Thoth comes fully equipped with magic. My mouth has been parted by Ptah with this metal chisel of his with which he parted the mouths of the gods." A single act of love makes the soul return to life. Once the deceased was rejuvenated back with all his senses, he could also interact and watch over the family members, affecting their lives. Letters have been found attesting to the continued contact, or at least, belief in the continued contact, between deceased and living. Through the ritual, the deceased could not only "see" but "be seen". Ancestors, invisible beloveds, live not only in your quiet center but in every cell of your being. In you, life matters and dictates all structure. Reclaiming our genealogy is reclaiming our ancestors, our genetics, and our epigenetics...but more, it means claiming our wholeness. Perhaps this is one reason genealogy has become the leading hobby online. We are the corporeal memory and structure of ancient lines. To be whole means to become reconciled with those sides of our being which have not been taken into account. Wholeness reconciles the rational or conscious and a more or less unconscious state. Our ancestors become more than names on the page, once again taking on lives of their own within us -- liberating, healing and transforming our mundane being. Conscious and unconscious do not make a whole when one of them is suppressed. The unconscious can only become known by experience, when it is no longer unconscious in the true sense of the word, but presents itself as strange, wild, chaotic, and apparently meaningless ideas, fantasies, dreams, and visions, which can appear from time to time, or burst upon a person like a flood. "The life and work of the Alsatian hermeticist and Egyptosophist, René-Adolphe Schwaller de Lubicz (1887-1961) attests to the continued presence of a distinctly nondual current of alchemical precept and practice in which material transmutation and spiritual transmutation are not separate nor merely coincidental endeavors but two indispensably linked sides of the same coin. The link, for Schwaller, was perceived as a juncture of meta-physical and proto-physical forces, a process conceived in terms of an alchemical "salt" (a neutralisation reaction between an "acid" and a "base" )." Egypt was known as the land of Khem. The word 'alchemy' originates from the Arabic phrase Al-Khemia, describing the fertile black soil and floodplains found along the Nile River. Khem was the god of fertility and reproduction who controlled the fertility of all nature, from the dark soil to humanity -- the fruit of the Tree of Life. Mater Alchemia states, "The Royal Syzygy ~ the marriage of male and female is said to be comprised of the powers of Love and Wisdom gathering themselves, coming together as the true philosopher's gold and the great liberation is the spiritual realization that your Soul, my Soul and the World Soul are one and the same." Jung concurs that alchemy is a Western proto-psychology dedicated to the achievement of individuation. In his interpretation, alchemy was the vessel by which Gnosticism survived its various purges into the Renaissance. Alchemy is the art of liberating parts of the Cosmos from temporal existence and achieving perfection which, for metals is gold, and for man, longevity, then immortality and, finally, redemption. Material perfection was sought through the action of a preparation (Philosopher's Stone for metals; Elixir of Life for humans), while spiritual ennoblement resulted from some form of inner revelation or other enlightenment (Gnosis, for example, in Hellenistic and western practices). "This thesis demonstrates that Lubiczian alchemy, by centering on the esoteric formation of all "bodies" , to include the hidden "nucleus" of continuity between metallurgical, biological and spiritual corporeality, speaks directly to the perception of alchemy as a nondual, operative-spiritual process." "Schwaller' s alchemy is quintessentially nondual in the sense that it encompasses both operative and spiritual processes. These are not separate but deeply interrelated realities. Through the idea of salt, Schwaller offers a holarchical explanation for the continuities between mineralogical, biological and spiritual bodies, and thus a theory for the material mechanism by which consciousness transforms phenomenal form." "A man should be able to say he has done his best to form a conception of life after death, or to create some image of it - even if he must confess his failure. Not to have done so is a vital loss. For the question that is posed to him is the age-old heritage of humanity: an archetype, rich in secret life, which seeks to add itself to our own individual life in order to make it whole." --Jung, , Memories, Dreams, Reflections. (New York: Vintage, 1963), p. 329. We are the result of our ancestors' biological and psychic existence, as our life derives from them. These figures represent “the dead [who] are animating us”—figuratively, the collective human memory that shapes our psyches. Descending into our depths we find ancestral images, not mere metaphors. They live on and are present in images. There is a sense of specific historical figures emerging -- fidelity to events and precise depictions of what transpires. Something significant is happening and needs no fictionalizing of what is already quite fantastic, but real. Dramatic sequences unfold in the time machines of our lineage. Actively engaged, we facilitate presentation of the stream of imagery. Such lyrical elaborations are evocations. These are the powers of the depths, the principles of the depths, and their voices which we hear. Our task is to uncover these figures so they show themselves. Genetic genealogy cannot provides specific names and contexts. Our descent is into human ancestry, perhaps even beyond. Our collective symptom is we have lost contact with the dead, broken a deeply spiritual connection with our ancestors. Our descent into the Underworld is an attempt to find a way to relate to the dead. We realize our lives depend on finding answers to their unanswered questions. The task is one of valuation, to live more fully. The voices of the dead have collective strength, collective message, importance and wisdom in what is coming up. Engagement with our own inner figures is our attempt to uncover the quintessentially human with a historical and collective root in the zeitgeist. We are part of it all -- the outside inside that is our self. We enter their process, fully engaged. Lyrical elaborations include the dramatic, aesthetic, poetic, artistic, painterly forms and all movement arts -- functional means of articulating experience. This is a process of the voices wanting the same things. We become poets of our psychophysical heritage -- a fuller and richer articulation of life, but with the weight of human history. We exercise our vision-making function. We each use the language given by the figures we deal with. We are forced in this confrontation to encompass what we've rejected in life. This is the collective Opening of the Mouth of the dead to go back in human history and recollect the meaning beyond each of us alone, to affirm the fullness of life, including its horrific aspects. Accepting the lament of the dead -- ancestors with their own voices -- is an eye-opening experience of looking differently into the past amplifying the eternal present, meaning beyond concepts. Engaging interactively rather than through concepts is a paradoxical way of wending through the labyrinthine collective with shared thought processes even as we individuate ourselves from it. If our dialogues tend toward the poetic, it’s because we are continually trying to make extensions from this world to the realm that lies beneath and beyond it … to convey a sense of the interconnectedness, and even identity, of all things. The language of poetry, with its metaphors and similes, is precisely that which connects: ideas to objects, images to emotions, and in some small way, outer events to great blazing inner realizations. Space and time collapse in the depth dimension of the eternal now, that is a way of escaping our denial of death. We cannot live in a genuine way without encountering the coldness of death. We come to terms with accepting responsibility for history. We are all engaged in this because what takes place in the collective takes place within us. We learn to recognize we are co-responsible for what happens in the world. Only by plunging into our solitude do we reconnect with the living. Life permeates the living and the dead as divine moments of truth. Michelangelo Buonarroti, The Resurrection- 1532. US Public Domain.